Editor's Note: This story was written before the release of 15 captives in August. 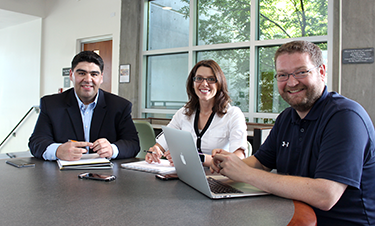 Third year law students Daniel Enriquez, Sarah Mahoney and Alan Heinz conducted extensive research for Nancy Hollander ('78) and Theresa "Teri" Duncan ('00), who represent a detainee in U.S. custody at Guantánamo Bay. Of the roughly 780 post-9/11 detainees who have been held in U.S. custody at Guantánamo Bay, 76 remain. That number may be one less, thanks to the efforts of two distinguished UNM Law graduates and four current UNM Law students. 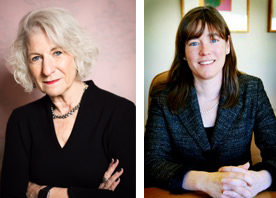 Nancy Hollander (’78) and Theresa “Teri” Duncan (’00) represent Mohamedou Ould Slahi, who the United States alleged to be an al-Qaeda operative. Nancy Hollander (’78) and Theresa “Teri” Duncan (’00) represent Mohamedou Ould Slahi, who the United States alleged to be an al-Qaeda operative. In his bestselling book, “Guantánamo Diary,” Slahi recounts his experiences as a detainee, from his arrest in Mauritania to his detention in Jordan and Bagram Air Base in Afghanistan, and ultimately to Guantanamo. Slahi has now been in Guantanamo for almost 14 years. 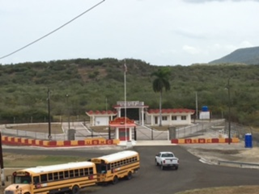 In June, however, Slahi had a hearing before a Periodic Review Board (“PRB”), which determines whether the continued detention of a detainee is necessary to protect the national security of the United States. In preparation for Slahi’s hearing, Hollander and Duncan wondered, why had the PRB recommended transfer in some previous cases, but not in others? Any such information could help Hollander and Duncan convince the PRB that Slahi does not pose a threat warranting any further detention. As it turns out, Duncan was teaching a litigation course at the Law School at the same time, and just a floor above, Professor Dawinder "Dave" S. Sidhu was teaching a national security course. Before their classes one day, Duncan and Sidhu were catching up when the conversation turned to Slahi’s hearing. They thought, perhaps some of Sidhu’s students could analyze the past PRB hearings, determine what swayed the panel members, and arm Hollander and Duncan with that information. Sidhu began his class session by raising this opportunity with his students. Heinz and his fellow classmates Daniel Enriquez, Sarah Mahoney, and Jason Patton studied twenty-nine PRB cases, reviewing the government’s allegations, statements from the detainee’s counsel or representative, statements from the detainees, transcripts of the unclassified portions of the PRB hearings, and the PRB decisions. In their analysis, the students extracted from the twenty-nine cases common factors and considerations that were important or influential to the PRB. The students quickly bonded together. Enriquez called it a “great group,” noting that, “The closest we came to any disagreement was over who got to analyze extra cases, because everyone wanted to shoulder the extra burden,” Heinz added. Duncan and Hollander received the group’s findings and headed to the PRB hearing. Last month, the PRB announced its decision: Slahi should go free. Beyond the result, the students walked away with an appreciation for the protections afforded to detainees. “One common theme throughout the assessment that shined brightly in my eyes was the continued respect for fundamental rights, human dignity, and accountability,” Mahoney reflected. “Deep in my soul, I am truly proud of how America chose to handle the detainee release reviews - even standing before our enemy, we continued to promote respect, leadership and integrity,” she offered. The students valued the practical nature of the experience. “As a law student, I feel that participation in a real world case is the best way to instill ethical and legal reasoning principles in our thought processes,” said Mahoney. “Real world cases allow law students to get their hands dirty while they are still in the nest, so to speak, and are surrounded by esteemed professionals to guide them along the way,” she added. Heinz agreed: “Law school tends to focus on the esoteric and abstract.” But the PRB project involved “essential” professional skills that have direct application to legal practice. “I’m doing my first internship this summer, and can now more clearly see how directly on-point this project was,” Heinz recognized. Lindsey Goodwin (’18) just returned from Guantanamo this summer. 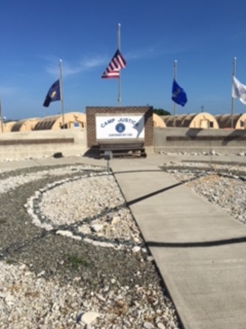 She took this photo of Camp Justice, where she stayed while in Guantanamo. Camp Justice is located right next to the courtroom so that visitors there for the hearings only have to walk over in the mornings. All NGOs and press stay at Camp Justice. To be sure, the PRB recommendation does not guarantee Slahi’s release. According to Duncan, the Departments of State and Defense now must identify a proper place, outside of the United States, to transfer Slahi, a process that includes discussions with possible host countries. “We do not yet know when or where Mr. Slahi will be released, but are working to ensure that the Departments of State and Defense act expeditiously and fairly,” Duncan asserted. The PRB project is but one way in which UNM Law students are engaged in national security law and the legal process at Guantanamo Bay. Thanks to the efforts of Sidhu and David Iglesias, ’84, UNM Law is one of only a handful of educational institutions worldwide that can send students to serve as legal observers of the military commissions at Guantanamo. This program started in 2013 and, since then, close to a dozen UNM Law students have visited Guantanamo. Goodwin also took this photo of the North East Gate which separates the U.S. base from the rest of Cuba. She visited “Cuba Gate” during a tour offered by base personnel every month. Second year student Jacyln Page just returned from Guantanamo this month. “I now come out of this experience with a greater understanding of what justice is and what it should be,” she shared.